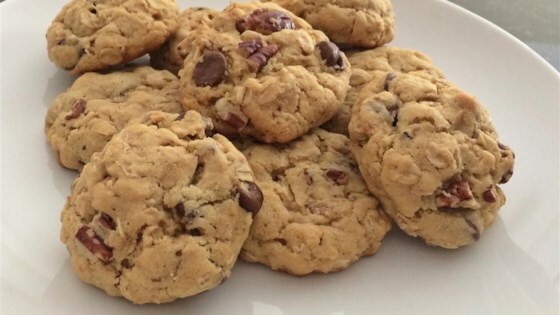 "These cookies are great for breastfeeding mothers! They are moist and super yummy and they help boost and/or maintain milk supply. And yes, husbands can eat them too! I have to hide these from my hubby when I make them! The brewers' yeast, wheat germ, flax seed, and whole oats are why these cookies help with milk supply for lactating mothers. Don't skip those ingredients!" Mix flour, brewer's yeast, wheat germ, baking soda, salt, and cream of tartar in a separate bowl; add to butter mixture and stir until just combined. Fold oats and chocolate chips into the dough. Whether you believe or simply need a reason to eat cookies! Made these for my wife today, she said they were surprisingly yummy! I did substitute the cream of tartar for baking powder and they turned out just fine. We will see if they help her supply.